Yes, we have had threads in the past about the Hollow Earth, but have you ever had anyone who says they have been there and can give you the grand tour? On the last episode of Cosmic Disclosure, Corey Goode, a member of the SSP, talked about his time there and describes what it was like. Quote: Corey Goode described the tour of the Inner Earth habitation that he and Gonzalez received after the conference, and after Corey's "mind meld" experience. The descriptions of the environment he gave from this tour were quite impressive—towering ceilings, elaborate architecture and stonework, enclosed, subterranean caverns the size of entire states, along with the highly advanced technology the priestess and tour guides used for most tasks. The scene was painted quite well, yet I found myself still wanting to know more (as well as to see this scene for myself). (Click here to read the post from last week, “Cosmic Disclosure: Relations from Inner Earth”. You can read the full article and see more pictures Here. There appears to be many others who believe in the Hollow Earth theory. In the article below, the author gives 11 reasons why the Hollow Earth actually exists. As opposed to the "hollow earth", my personal beliefs go along with Corey Goode; I think it is more like a honeycomb. 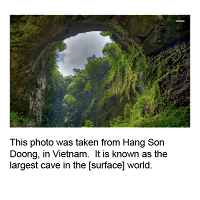 Where I live, there are so many caverns beneath us, we get large sink holes quite often. This area will probably fall in if we get a large enough "shaking" from a nearby earthquake someday. One minute we're here... the next we've sunk down into the rabbit hole. OK, all you Hollow earthers out there, I have a video that is a little compelling with what appears to be evidence, but then again it could just be CGI. You Lurking Guest that don't bother to register, how about registering, It is free and give your thoughts. You Flat Earthers should reply also, I know the two different groups often don't agree. Quote: Today we're going to point the skeptical eye at yet another alternative science that has managed to hang around for centuries despite being obviously wrong, the hollow Earth. There are many different models of hollow Earth theory, and support from equally diverse communities. It is a mind-bending example of how people can mold their world views to fit their beliefs, and then mold science itself to fit the world view. 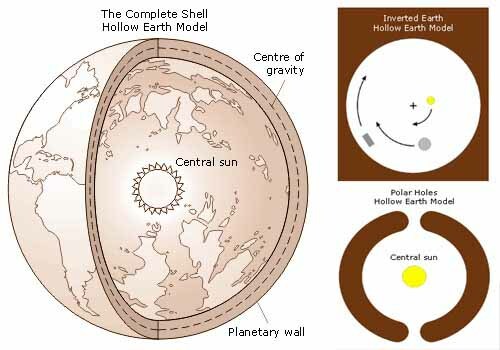 Today, the prevailing hollow Earth theory states that the Earth is a hollow shell, with its inner surface being much like the outer surface where we live. It has oceans, mountain ranges, and clouds; and hovering at the very center of this hollow ball is a miniature sun that warms the inner-surface residents. Slightly offset from the North Pole and the South Pole are holes that allow travel between the outer and inner worlds. The civilization that lives on the inner surface is more advanced than ours, and they fly in and out through the polar openings in flying saucers, which explains UFO sightings by the outer surface civilization. Only the government knows about the polar openings and the inner civilization, and they suppress this information; ostensibly to prevent other governments from finding out about it and claiming the territory. To most of us, this sounds like a pretty far-out concept; so many applications of various sciences prove it wrong. Nevertheless, even today, it has its supporters. Many books are available earnestly promoting the theory. Websites such as OurHollowEarth.com, HollowEarthNetwork.com, and HollowEarthTheory.com provide only a starting point for active communities who firmly believe this. Conspiracy mongering is a big part of most of today's hollow Earth writings: familiar assertions that the government is covering it up, the proverbial "they" don't want you to know about it, and that we should all "wake up" and see the truth. But this is the least interesting part of hollow Earth theory, and only its most recently introduced aspect. There is a rich and surprising history behind how this all came to be; a journey that began with scientific inquiry, but then went through philosophy, the comfort of knowing the universe was small and comprehensible, and religious zealotry. In the late 1600s, Isaac Newton had been active for some time and a lot was already known about the Earth and its place in the cosmos. Although science had very good measurements, underlying theory in many areas was incomplete. For example, we knew that the magnetic pole had shifted over the centuries, but there was not yet a sound consensus on what made it do so. We knew about the aurora, but knew little about its cause. Astronomer Edmond Halley, after whom the famous comet was named when he calculated its orbit, presented his theories on both of these matters to the Royal Society. Halley proposed that ferrous matter constituting the magnetic pole may have been movable because it was not attached to the Earth's surface, but was instead embedded in a freely-floating sub-sphere inside that upon which we live. He suggested that there were as many as three such layers around a solid core, all gravitationally centered, and all separated by atmospheres. He suggested that the aurora could be caused by luminous gases leaking out of a polar opening. Newton had already shown that the Earth was an oblate spheroid, thickest at the equator. This made sense to Halley, who figured that the outer crust was therefore thicker at the equator to account for the oblation and thinner at the poles; so thin that there could have been permeability for his luminous gases. He also reasoned that if there was light and an atmosphere between each layer, each might well be inhabited. Another name from science has frequently been associated with the hollow Earth, that of Swiss mathematician and physicist Leonhard Euler, perhaps the most important and prolific mathematician of the 1700s. In one of his books, he discussed what would happen if you drilled a hole all the way through the Earth and dropped a stone through it. Apparently, despite much namedropping by various hollow Earth authors, this one statement was the closest Euler ever came to endorsing their theory. It appears that Euler's association with hollow Earthers is completely misinterpreted and made up; there's no evidence that he was a believer. Moreover, he openly criticized Halley's idea of concentric shells in a later volume of the same book. It was Cyrus Teed, an American alchemist and pagan healer, who first proposed a different Earth model, based on what he described as a spiritual illumination from the Divine Motherhood. In Teed's view, the universe was inside out. The Earth was a sphere, but inside-out. The sun, moon, and all celestial phenomena are contained within, and we all live upon a concave surface that matches precisely the distances and directions of the conventional Earth model. We are all, according to Teed, living inside an isolated enclosed hollow cell in a universe of solid rock. Teed established the Koreshan Unity, a sort of commune church where celibacy was practiced and hollow Earthism was the philosophy. In a book published in 1870, The Cellular Cosmogony, or the Earth a Concave Sphere, Teed described his own theories of light, gravity, and many other sciences to fit his proposed model. Perhaps the greatest story from the annals of hollow Earth theory was launched in 1897 by Ulysses Grant Morrow, a member of Teed's Koreshan Unity, and a fellow believer in the inside-out universe theory. Morrow had made numerous sightings at water level and verified the visibility of objects that should have been below the horizon, given a globe-shaped Earth; but he found that scientists dismissed his results because they could have been accounted for by simple atmospheric distortion, as is common at sea. Morrow contrived an experiment that he felt nobody could argue with: the construction of an absolutely straight reference line, four miles long, over water. If the inside-out theory was correct, Morrow's construction would be close to the water surface at its ends and high off the water at its middle. He went to work. What he ended up with was a set of four "rectilinears", 12-foot-long and 4-foot-wide mahogany and brass rectangles, specially and carefully constructed by the Pullman railroad car company. The rectilinears were shaped like the letter H, diagonally cross braced with steel bars for rigidity. They were designed to bolt securely to one another with absolute precision, and extend a perfectly straight line. It wasn't practical to build four miles of rectilinears, so Morrow planned to start with one that was absolutely level, and then extend the line, leap-frogging each rectilinear from the back of the line to the front as each was secured in place. Each piece would be inverted when it was moved, to cancel out any possible asymmetries in the construction of each. If the Earth's surface were indeed curved, either concave or convex, the distance between the rectilinear and the mean water level would change slowly at first as the line extended, and the error would increase they further they went, as the curve grew steeper. The mean water level was determined using caissons along the route, at which tides were measured and corrected for. The first rectilinear was positioned on March 18, 1897, solidly held on two securely anchored standards, and exhaustively leveled using two calibrated levels and a plumb bob. Morrow's team proceeded slowly and deliberately, spending nearly two months to traverse the four miles. Data was carefully measured and recorded the whole way, by multiple independent teams, with every number double checked and initialed. The results? Exactly as Morrow had expected, the data showed the Earth curving upward toward his rectilinears at a rate that consistent with a concave, hollow Earth with a radius of 4,050 miles (6,519 km). The Earth's actual radius is 3,963 miles (6,378 km). Morrow's measurement of the Earth's size was correct to 2.2% accuracy — but as a hollow, inside-out sphere on whose inner surface we live. This was a huge confirmation for the Koreshan Unity Foundation. Modern analysis of their published data shows no methodological errors, and their experimental design was sound. How, then, can we account for their result? The answer lies in the construction of the rectilinears. One survives today, on display at the Koreshan State Historic Site in Lee County, Florida. Although the rectangles were diagonally braced with steel rods to keep them precisely square, a critical attachment is missing. The steel rods were not connected to one another where they intersect, nor were they connected to the main structural cross bar. The intersection was freely floating. If there had been a connection, each rectilinear would have indeed been a rigid rectangle. Instead, this intersection was free to move up and down, allowing the structure to relax into a slight trapezoid. If supported by one end only — as each necessarily was when being bolted to its neighbor — it sagged, probably not enough to notice by eyeballing. Morrow assumed that inverting each segment each time it was reused would cancel out any irregularities. But this design failure meant that each section sagged downward regardless of which way it was oriented. As the Earth's surface curved downward away from Morrow's line, the line sagged downward twice as far, creating the illusion that the Earth was curving upward toward the line. That it happened to sag just enough to give an exactly opposite radius for the Earth appears to be just a coincidence. The inside-out universe as a form of religious mysticism continued in Nazi Germany under the leadership of Luftwaffe pilot Peter Bender, who became head of the religious order; and whose work was continued by Karl Neupert, author of Geokosmos. A whole host of German authors continued this theme throughout the 1930s and 1940s. But it was American John Symmes who was the earliest successful promoter of the model most popular today, that the Earth and universe are as we observe but that there is also a civilization living on the inner side of the Earth's crust. Symmes was actually close to getting the American government to sponsor an expedition to find the north polar opening, but when President Andrew Jackson took office in 1829, the plan died. And while the inside-out universe theory has withered away, the inner- and outer-world model has comparatively flourished. Gone are the colorations of early scientific inquiry and religious mysticism, and in their place is simple conspiracy mongering. Recent authors, such as Raymond Bernard in The Hollow Earth: The Greatest Discovery in History claim that many of the great early polar explorers were actually on secret missions to discover the polar openings and contact the inner-surface civilization. South African author Jan Lamprecht suggests that all the rocky planets in the solar system are constructed this way. Some of his evidence of a secret polar opening includes the fact that animals migrate seasonally, and where else would they be going; and the fact that early maps of the northern regions would be changed over the centuries, consistent with official coverups. Whatever model they espouse, hollow Earth theories represent a fascinating look into the culture of the time. Whether it was Halley's genuine scientific curiosity, Teed's and Bender's counterculture religious beliefs, or modern anti-establishment conspiracy theories, we find that the hollow Earth is not so hollow after all; but is pregnant with sociological insight. The riches of any urban legend are found only when you dig past the legend itself. It can't be hollow now, I'm sure we've filled it with all our rubbish and plastics! Whoa, you brought this thread from 2016 back to life? Well, thank you all for finally answering. There has been lots more information come out about the inner earth since I posted this. Hey... it's almost time for some heavy duty disclosure to come out now, including ways to get rid of all that plastic in our oceans. Emery Smith has some patents on some technology he will be releasing soon. He said the major problem are things that can heal sick people of cancer, diabetes, etc., the things that are big money makers for Big Pharma. He has the cure, but they won't allow us to use it. If that doesn't piss you off, you are brain dead. believed that there's more than meets the eye down there. It is disturbing to see those tunnels appear to run right under my home town, but that would explain the booms being heard around the area last year. Were they blowing up the passageways? Current time: 04-23-2019, 11:34 AM Powered By MyBB, © 2002-2019 MyBB Group.